A while back, one of my colleagues was getting ready to direct Into the Woods, and was telling me how excited he was about the project. “I mean,” he said, “this show has real depth – it’s not like The Pajama Game.” Which I let go at the time, since I like the Sondheim work a lot myself. But I also like Pajama Game, and especially like its no-pretensions-here attitude. I think some of the “deep” Sondheim stuff gets credit for using what is really cartoonish neurotic behavior as sophistication, at the expense of more realistic-but-still-funny recognizable stuff, like “friendship,” say. In Into the Woods the cartoon behavior works, since the characters are archetypes anyway, and they are allowed to be funny, not just sarcastic/wounded. It doesn’t have the standard late-20th-century this-is-important undercurrent to the humor. The Pajama Game, while not as minute-to-minute effective as a bunch of other classic musicals (including one that shares a bunch of DNA with it, The Music Man), uses some comedy tropes really well. I think the female lead’s first number is well paced and silly in a good way, in line with a lot of Hammerstein numbers. I appreciate the chorus’s “obviously, naturally, definitely” responses – pretty much the same thing as you’d find in lots of buddy-comedy songs. Who doesn’t like musical banter? It’s true that the whole show bogs down a bit, and the movie version in particular doesn’t show the later numbers to their best advantage, but still, the thing holds up way better than lots of message musicals or the more recent jukebox shows. I know that part of my affection for it is based on growing up with the cast recording, which was on a regular rotation in our house with other classic 50’s shows, for which I thank my mom. And it is funny for long stretches, featuring mainly gentle ribbing. It is not trying to address the ills of all the world – so, I guess it’s not deep, but that’s OK. So, I’m hoping that the upcoming movie of Into the Woods is very funny in addition to having depth, as my director friend would say. I’m cautiously optimistic, given the basic gentle humor between the characters I’ve seen in stage productions. But then, there was that awful movie of A Little Night Music which had no comedy whatsoever. 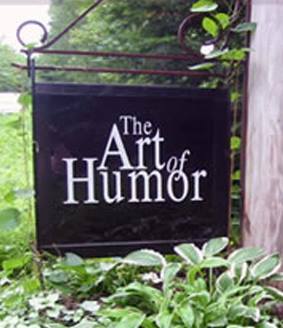 On a short trip up Route 100 today, we passed a sign that said “Art of Humor Gallery – next right.” It seems like it’s a real thing. ← Have bass clarinet, will travel, with some extra planning..